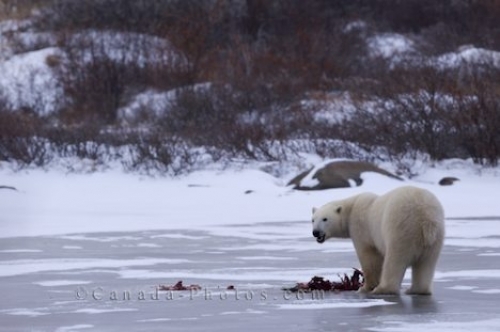 The lakes and landscape around Churchill, Manitoba in Canada have finally become frozen and blanketed with a layer of ice where this polar bear enjoys one of his first winter meals. This meal of Ringed Seal is a favorite for the Polar Bear and after a long summer, winter is a welcoming sight. As this Polar Bear rips away at his meal, he keeps a close watch on the area for any unwanted visitors trying to move in on his leftovers. The Polar Bear will only eat the skin, fat and internal organs on a Ringed Seal, leaving the meat behind for any scavengers looking for a good winter meal. Picture of an adult Polar Bear enjoying his meal of ringed seal on a frozen lake in the winter in Churchill, Manitoba in Canada.